Hi friends. I thought it was time for another chicken update. In my last update, I reported that all of the Bigs (about 21 months old) were molting. I am pleased to announce that all of them have regrown their feathers, and at least two of them, Rocky and Esther, have laid eggs since molting. 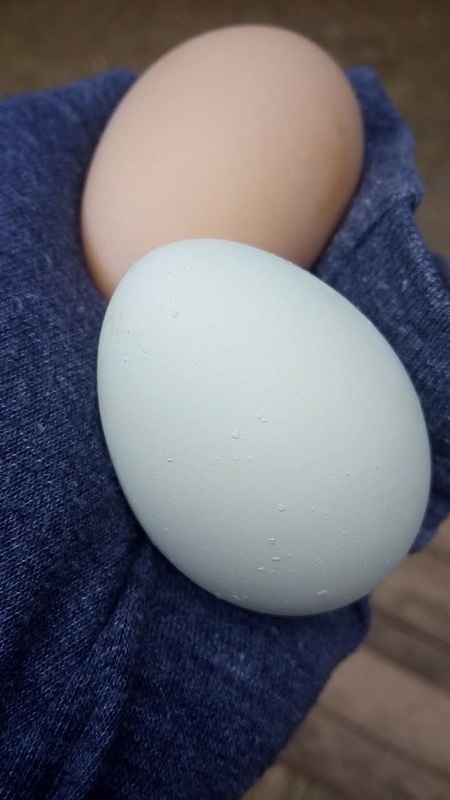 That isn't supposed to happen--they're supposed to wait until spring to start laying eggs again after a molt, but my chickens don't concern themselves too much with following rules. We also had a stretch of warmer weather, which I'm sure helped with the egg situation, especially for Rocky. Also laying right now are Littles (almost 11 months old), Hazel and Indigo. Indigo's been laying all along, but Hazel took an extended break in December. Hazel also had some missing feathers on her breast in early January, but has not gone through a full molt. Koko was laying regularly up through early January, but hasn't laid an egg in weeks now. I don't know why, although I have been seeing more Koko feathers than usual on the floor of the hen house. I have been letting the girls out unsupervised for an hour or two before sunset every day. There are fewer aerial predators around this time of year, and the girls have also gotten better at taking cover when they hear or see a predator. A couple of weeks ago, I saw them make a break for the coop when they heard a hawk. The hawk turned out to be a crow, but better safe than sorry when you're a chicken. It's been really nice being able to let them out and know that they'll be ok. Of course, now there's snow on the ground, so they're not venturing out as much. A few weeks ago, I let the girls out, and when I went out to put them back in again, I noticed that someone had pooped on our deck. Naughty girls. So I got my poop scoop, went back to the deck, took care of business, and then walked back to the coop. I got the girls in for the night, and then as I was walking back to the house, I noticed an egg on my path. An egg! On the path! It hadn't been there as I had been walking back and forth, so someone (probably Hazel) laid an egg on the path on her way back to the hen house for the night. Just in case you don't know, it actually takes a while for a hen to lay an egg. My girls will hang out in the nest box for sometimes an hour or more, before the egg comes. Eggs are not surprises. But apparently this one was. It had the same hazy coating on it as the ones I found in the run early on when the Littles first started laying. So maybe that coating happens when eggs come faster, and maybe they do come as a surprise. In deference to colder temperatures this week, I put the mama hen heating pad back into use, this time in the hen house. I have it set to the lowest setting, and I turn it on when the overnight temperatures are -5°F or lower. It's just there to take a little (tiny) bit of the chill off. I also left it on during the day when the high temps stayed below -5°F this week, just so the girls had someplace to warm up during the day. They didn't hang out with the heating pad all day, though. They spent their time in the run, eating, scratching, and preening. Honestly, the heat is more for my peace of mind than for the chickens' benefit. As I say over and over, they do better with cold than with hot. We had extended periods last winter when the temperature did not go above 0, and they were just fine. The chickens are fine, but some of the eggs have not been. I didn't get to a couple until they had frozen and cracked. No worries--I just thawed them, then scrambled them, shells and all, and fed them back to the chickens. It was a win-win: I didn't have to waste an egg, and the girls got a yummy, warm snack on a bitterly cold day. And I think that's all for now. See ya next time.